The Camber is the perfect bike for everything from weekend trail rides to all-day epic excursions. 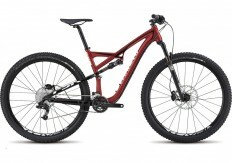 Specialized developed the Camber to give trail riders everything they need, and nothing they don’t. The result is the perfect blend of performance, capability, and value. The 29-inch-specific, 110mm-travel Camber delivers lightweight alloy and FACT carbon frame options, tubeless-ready Roval wheelsets, and a trail-specific build and geometry for confident riding at speed.